Since 1943, Speer has built a reputation for innovation and performance. 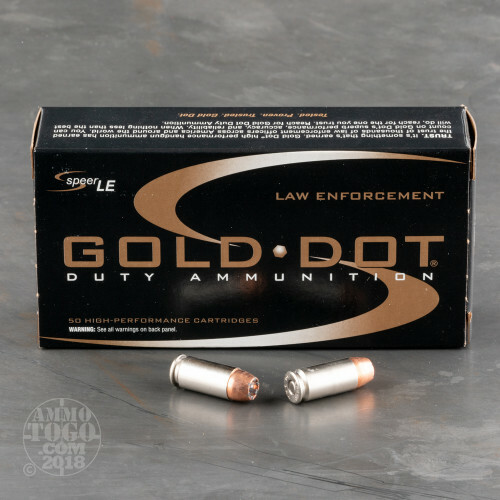 Today, Speer’s Gold Dot line of ammo is the most trusted duty ammunition for law enforcement officers across the country. 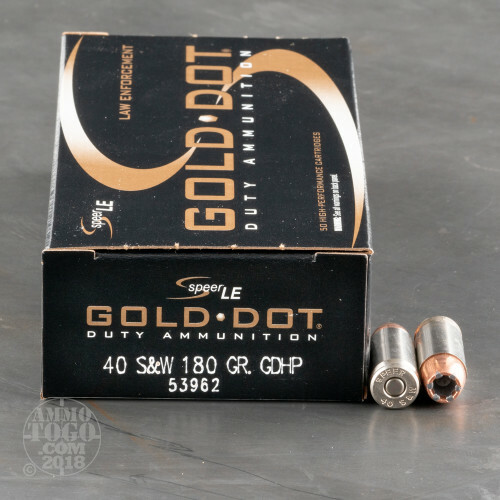 This package contains 50 rounds of Speer LE Gold Dot .40 Smith & Wesson ammunition. Each round is loaded with a 180 grain Gold Dot hollow point projectile. The nose on these hollow points is smooth and rounded to deliver easy, reliable feeding in most modern semi-automatic handguns. 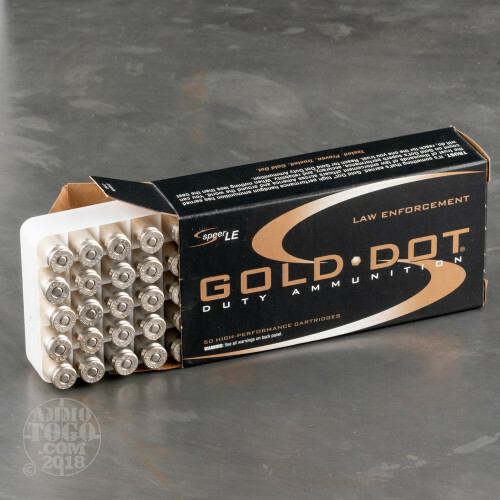 Finely tuned by Speer’s engineers to ensure optimum expansion and incredible penetration, Speer Gold Dot uses a patented electrochemical process to permanently bond the alloyed lead core to the copper jacket of each bullet one molecule at a time. This process virtually eliminates core/jacket separation for nearly 100 percent weight retention and guarantees uniform jacket thickness for superior accuracy. Perfect for use as a law enforcement duty round or civilian personal protection, this new production ammunition features clean burning propellants and highly sensitive CCI primers. 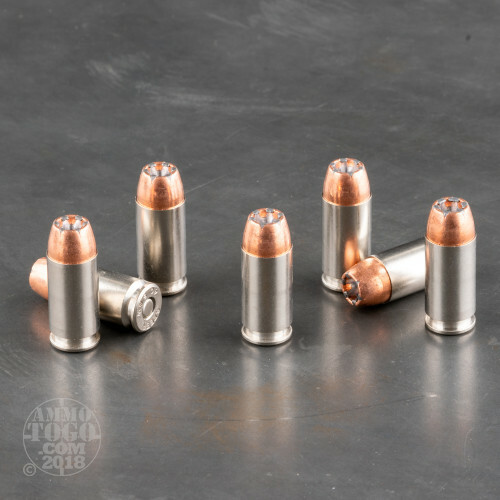 Loaded in highly visible nickel-plated brass casings, this ammunition provides smooth feeding, increased durability, and easy loading even in low light conditions. Each round delivers a consistent muzzle velocity of 1025 feet per second and a threat-stopping muzzle energy of 420 foot pounds. This is top-of-the-line self-defense ammunition, whether on duty or off. 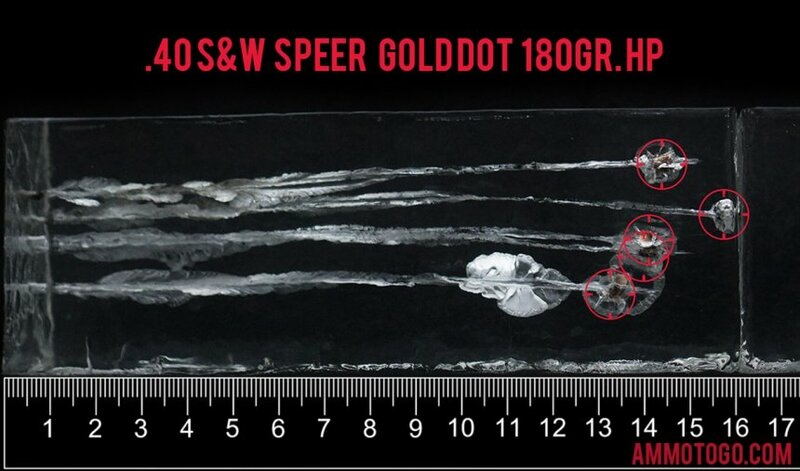 We fired five rounds of this Speer 40 Smith & Wesson ammo through a cloth barrier into Clear Ballistics calibrated synthetic gelatin and recorded the results. For these tests, we used a S&W M&P40c with a 3.5-inch barrel. In the photos, graphics and video on this page, you can see specifically how the Speer ammo performed and how it sticks up with the rest of the 40 Smith & Wesson ammo we have tested so far. Expansion Diameter Compared to All 40 Smith & Wesson Ammo Tested MIN 0.39" MEDIAN 0.65" THIS AMMO 0.64" U.S. dime MAX 0.89"
Penetration Depth Compared to 40 Smith & Wesson Tested 0" 10" 20" 30" MIN 9.8" MEDIAN 16.5" THIS AMMO 14.3" MAX 32"